Primetime drama actress Glaiza de Castro was taken to a doctor after experiencing health problems during the taping of her show, Stairway to Heaven. What was planned to be a short nap resulted in a terrifying moment of numbness and troubled breathing. Glaiza recounted her ordeal on Startalk. Show business is a hectic world and fatigue can take its toll on an actor's health without them even realizing it. This is exactly what happened to Glaiza de Castro last Monday, October 12, as she was forced to leave the shooting of her drama soap, Stairway to Heaven, after experiencing troubled breathing on the set. 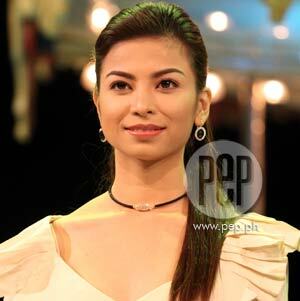 "After two scenes, natulog muna ako," Glaiza recounted to Startalk yesterday. "Tapos nagising ako na hindi na ako makahinga. Naghanap ako na puwede ko makuhanan ng hangin, iyong hindi masyado kulob. Tapos noon, hinga ako nang hinga nang mabilis." Shortness of breath was not the only thing troubling her. Numbness had started in her foot and was slowly making its way up to her head. The feeling terrified the young actress. "Naiiyak na ako kasi first time nangyari sa akin iyon, e. Tapos nakikita ko iyong kamay ko naninigas na!" All of these were enough for her to go directly to a doctor to find out exactly what was happening to her. As it turned out, it was all because of stress. LACK OF SLEEP. "Wala masyadong tulog at naligo agad," shared Glaiza. "Parang nabigla siguro katawan ko. Malamig pa naman yung tubig. Tinanong nga ako ng doctor kung may nakaaway ako, ano, pero sabi ko na wala naman." Glaiza added that after resting a bit, she felt that she was ready to go back to the shooting. "Kaya ko naman," she said. "Kung kailangan mag-taping puwede ako mag-taping kasi kaya ko naman, e."
On a lighter note, does her lovelife have anything to do with her stress? It has been said that her dates with Patrick Garcia were becoming frequent. Are they a couple now? "Ngayon lang kami ulit nagkausap-usap," smiled Glaiza. "Savor lang namin yung moment na bago matapos ang Aagawin Mo Ang Lahat Sa Akin, e, makakapag-bond pa kami." Then she quipped, "Di ba, pag may lovelife lalong nakaka-stress?"